With Memorial Day Weekend upon us, I’m reminded that Summer is practically here. Time to dust off the bbq and find some fun new recipes to try out. I ran across this one at seriouseats.com and was intrigued. I happened to have a container of dried hibiscus flowers in my pantry (It’s like Felix’s magic bag of tricks, you never know what I’ll pull out) and was excited to use them. The last time I made a cocktail from them, and the reason I purchased a big old jar, was for a signature drink for a cocktail party and I was underwhelmed at the taste. Thus, they sat way back in the dark collecting dust. The color grabbed me right away…..a rich jewel-like red. I made the recipe just as it appears. This is a really uniquely tasty punch, perfect for a summer bbq or picnic. The recipe itself has a low proportion of booze in it, but you could adjust the quantities as desired. I ended up adding a bit more simple syrup, something I almost never do, as it was a tiny bit more tart than I wanted. Hibiscus flowers give a tartness that is vaguely reminiscent of cranberries, yet retain a hint of a floral note. And the mint lends a mojito-like feel to the drink. I disagree with the writer, this does not taste at all ‘lemonade-y’ to me. 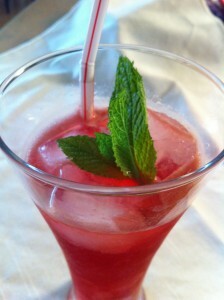 In fact, I think it would also be great with a higher percentage of the lemon/simple syrup to the hibiscus tea. I made one with club soda, one with ginger ale (which added a nice bite to things) and one with prosecco. All were enjoyable. I’ll make this again when I have friends over for a gathering. It’s nice to have a pitcher drink to save the hostess from individually shaking each cocktail. Note: I recommend removing the fresh mint leaves after a few hours, or the base will become overwhelmingly minty. I shall have to take another look at hibiscus (available at any Mexican market or online). This is refreshing and unique. 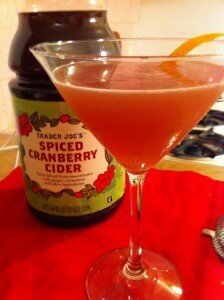 This year my old friends at Trader Joe’s have provided me with yet another source of holiday martini inspiration. Muddle some fresh peeled ginger in the bottom of a shaker. Add the remaining ingredients and shake with ice. Strain, pour and garnish with a strip of orange zest and a dash or two of orange bitters. Fee Brothers makes a nice one. The cider is also nice on it’s own for your non- imbibing guests.